Over the past few years, I have done a bit of business with STX Putters, even developing and performing a branded putting clinic to help promote and sell the company�s putters. A division of the lacrosse stick manufacturer in Baltimore, Maryland, STX is a pioneer in insert face technology and offers color coded face inserts that vary in softness and resiliency. I am trying the Sync Tour Pro, which is the same putter that Rich Beem used to win the 2002 PGA Championship. The center-shafted putter features a bullet-back design which places the sweet spot directly behind the ball. My model has the black insert, which offers the softest legal face in golf and the longest dwell time for least skidding and truest roll. While a bit light, I like the look from over the putter. Recently, the company, header-up by friend and GM Jason Goger, has revitalized its putter line-up with some great new models that I look forward to testing. Now for your take: Have you ever tried an STX putter? Do you like face inserts, or do you prefer a stainless steel or milled face? Please leave your comment below. 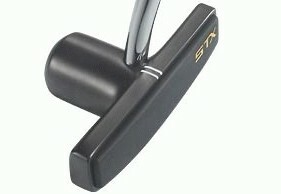 I tried the STX sync tour pro putter; I had never broke the 90’s . I must say that I boke the 80’s using this putter(shot 79). The putter played a large part; it is ease to align and control.